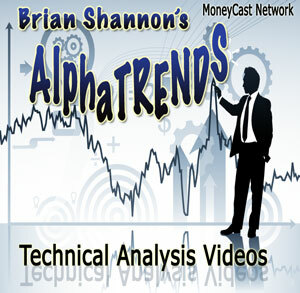 Guest: Brian Shannon – of AlphaTrands and a great review of Technical Analysis. Brian delivers educational videos daily on technical analysis and helps thousands of viewers understanding charting techniques. 1) How did you get started Charting? 2) Why is technical analysis beneficial? 3) Difference from Other styles of analysis? 4) What are some patterns you look for? 5) What are the most overused and unreliable chart types? (ACOR) – Acorda Therapeutics is discussed as a potential long trade. Brian picked this right before it broke out and shares why this was on his list of potential gainers. Listen to podcast and download the charts to follow along with the discussion. Andrew begins this podcast with a few choice comments on the current state of the markets and why he is not providing stock tips in this market. Andrew has teamed up with CyberTrading University to bring you a special class designed to make you a more successful investor.